The first decorative village sign is said to have been made for the Royal Sandringham Estate in the early 1900s and quickly caught on, with a village signs competition put on by the Daily Mail in 1920. While other counties have adopted the village signs tradition, such as Suffolk and Essex, its heart is in Norwich and there are many fascinating signs to discover. Here are just 13. 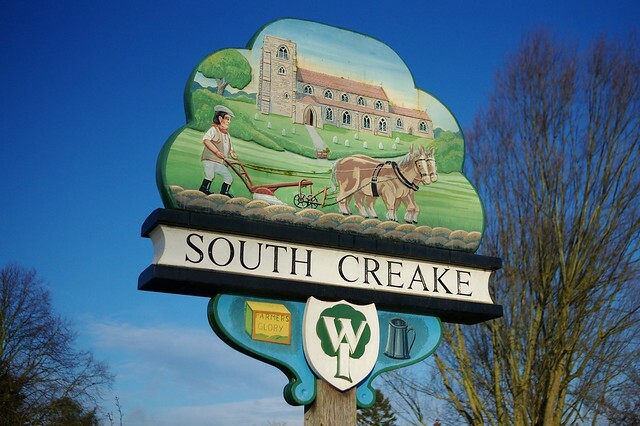 As a testament to South Creake’s farming past, the colourful village sign depicts a farmer ploughing the land with the Church of Our Lady St Mary in the background. When you visit: don’t miss the Iron Age Bloodgate Hill fort that’s nearly 2000 years old; it is a fine example of early settlement in the country. 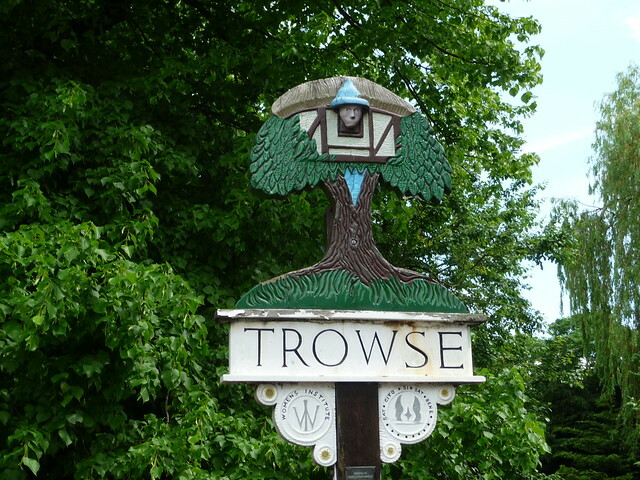 The village of Trowse, just outside Norwich, was historically used for workers at the Colman’s mustard factory. The name is reportedly derived from the Saxon word for tree house, which explains the man frolicking in a tree on the quirky village sign. When you visit: go for a walk around Whitlingham Broad, or stop in at the vegetarian café, River Green. 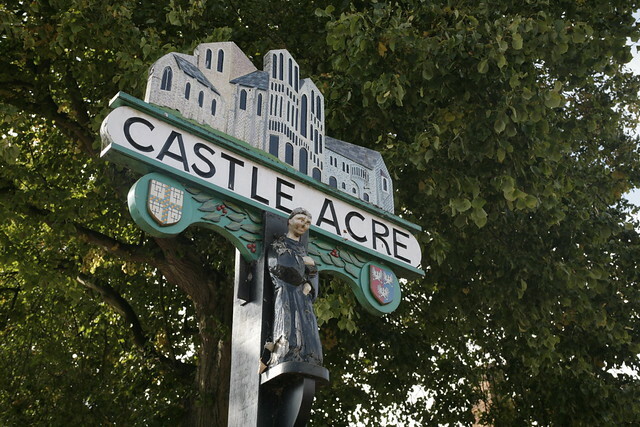 The village sign in Castle Acre shows Castle Acre Priory. At almost 1000 years old, these stirring ruins were originally founded by William de Warenne, 1st Earl of Surrey, who fought in the 1066 Battle of Hastings. When you visit: make sure to visit the ruins of the priory and also the motte-and-bailey Castle Acre Castle. 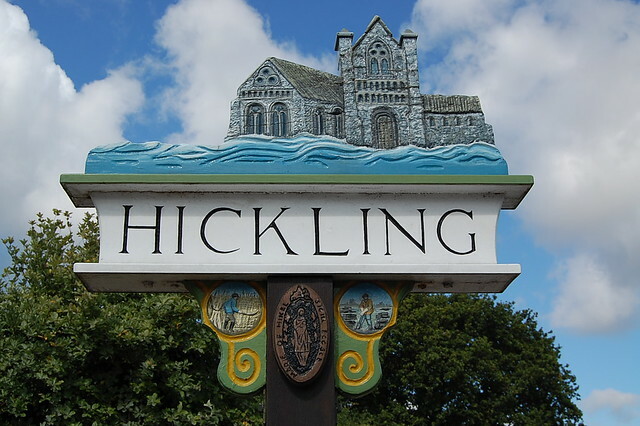 The attractive village of Hickling is made up of Hickling Green and Hickling Heath, which is next to Hickling Broad. The village sign shows the Augustinian Hickling Priory and water which represents the water of the broad. When you visit: don’t miss the grade II* listed Hickling Mill. 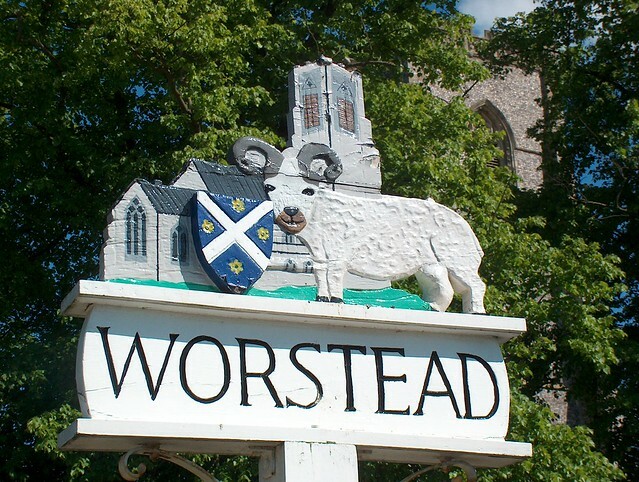 Worsted cloth was named after the village of Worstead where historically, Belgian weavers settled, creating an affluent place that became known for it’s yarn production. The village sign shows a large sheep in front of St Mary the Virgin Church. When you visit: duck into the White Lady, a cosy pub with brick fire that serves nine real ales. The colourful village sign at Holme Hale may be a nod to its penchant for open gardens as part of the National Garden Scheme. When you visit: Holme Hale Hall will open its gardens for the Scheme on Sunday 14th May and Sunday 13th August this year, from 12pm – 4pm. Admission is £6, children are free. Tearooms and car park are available. The gardens can also be visited between April and September by appointment. The arresting village sign in Brampton is based on an ancient Roman brooch that was found in the village and is now on display in Norwich Castle Museum. When you visit: the River Bure runs through the village making for pretty walks. Approximately two miles from Sandringham is the village of Wolferton. The village is perhaps known for its railway station that the royal family used to take to reach the Sandringham Estate. 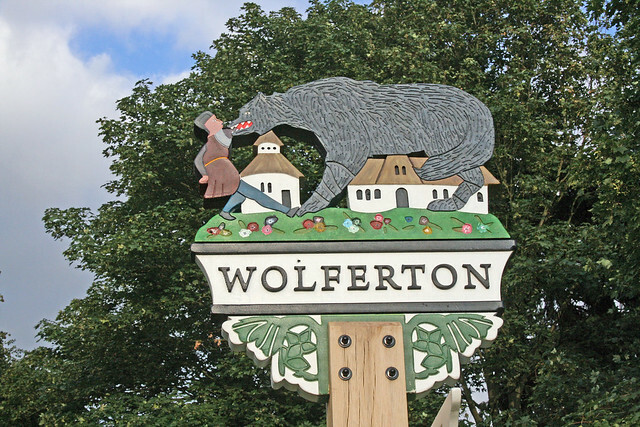 The village sign shows a wolf attacking a man. When you visit: the Sandringham Estate has well kept gardens, a museum and you can even have a tour of the Royal house. The coat of arms of the Wodehouse family is flanked by two medieval ‘wodewose’ or wild men, from which the family name is derived to comprise this village’s sign. The family has owned land in the village since the 1370s. 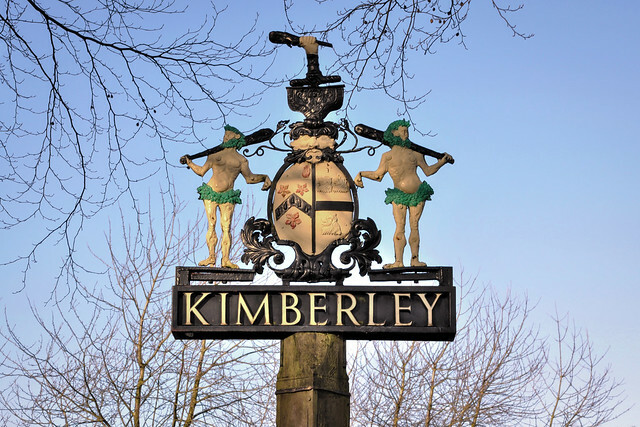 When you visit: there are plenty of events held throughout the year at the historical Kimberley Hall including walks, country fairs, garden theatre and much more. A striking, impressionistic portrait of Boudica, Queen of the Iceni, riding a chariot with golden crown and spear is the village sign for Quidenham. The legendary Queen is buried in the village, according to local tales. When you visit: there is pretty Norfolk countryside surrounding this village to explore. The village sign in Ormesby St Michael depicts the eponymous Saint Michael fending off the devil. When you visit: nature lovers will enjoy Ormesby Broad and Hemsby Beach which lay a couple of miles to the east. Stay the night in the Boathouse, the pub, hotel and wedding venue on the picturesque Ormesby Broad. 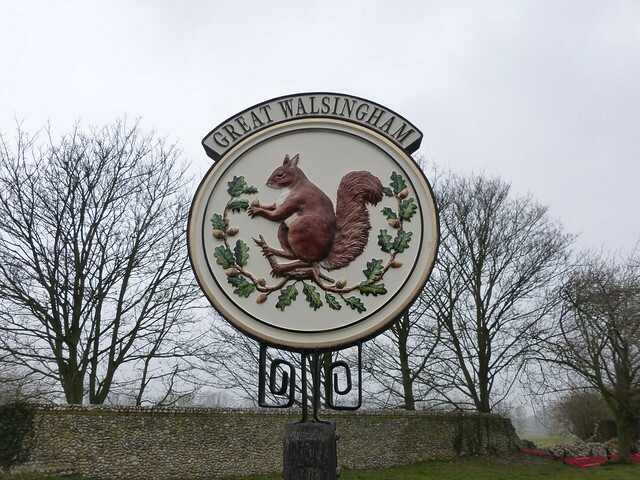 The village sign in Great Walsingham depicts a squirrel and acorn which represent part of the Lee-Warner family crest who owned manors in Great and Little Walsingham. The acorn may also reference the ancient oak tree on the village green. When you visit: the villages of Great and Little Walsingham are charming places to explore with old pubs (such as the Black Lion), charming cottages and of course, the Shrine of Our Lady of Walsingham, an internationally-known pilgrimage site. Picturesque Crimplesham is a small village of just over 200 people nestled in the west Norfolk countryside. Its sign shows two figures who lived in the village standing in front of a scene with a farmer ploughing the land and some sheep next to a pond. According to the parish website, one figure is a freewoman, Ailed, and the other is Rainald, a Norman adventurer. When you visit: two miles away from Crimplesham in the neighbouring village of Stow Bardolph, is the Hare Arms, a lovely, ivy-clad pub with a conservatory room, perfect for sunning in with a drink in hand.